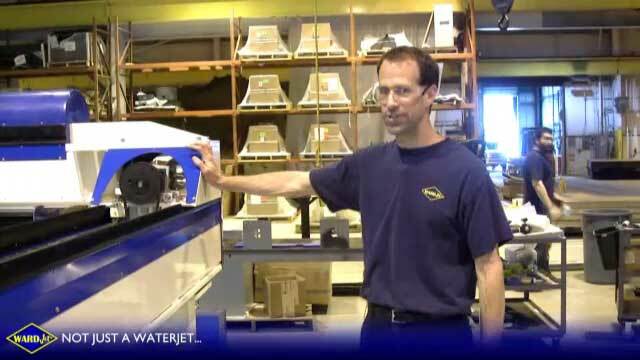 Jeff Day, Sales Manager, demonstrates WARDJet's use of proven, standardized parts used in custom applications. We've spent years designing and perfecting our base designs and our technology. Our goal is to design our machines in such a way that small component changes can make huge differences in form and function. Our use of these standard parts allow us to focus on the functionality of a custom machine without the worry of custom parts. This approach also allows for easy replacement of parts without a long lead time. The easier it is to replace parts, the less time your machine will be down should the need arise. Taking a quick glance at one of our custom machines next to a standard machine, you will immediately notice similarities in construction and design. Jeff walks us through some of these similarities while pointing out the differences and explaining the reasons for the design changes. Contact us today to discuss one of our standard machines or tell us your custom application. We would love to design a custom system just for your needs.